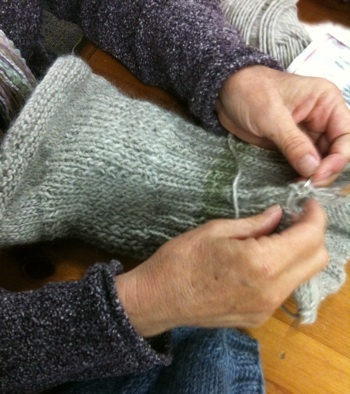 Charis, Beautiful Work - I love that you are getting answers from your Sweater Sampler! Susan, the fabric you are producing as you enjoy your knitting is quite rich! 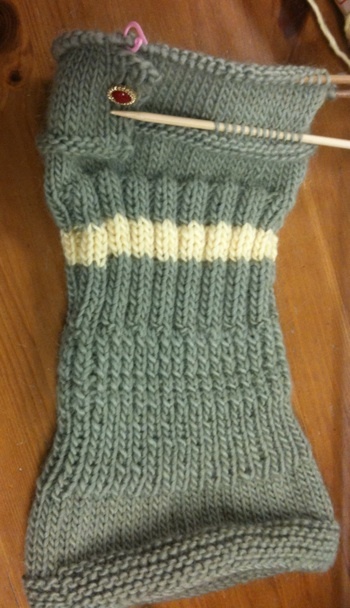 And again, I am appreciating the learning you are able to have in your sampler knitting! To review – we went over things learned from doing the Cardigan Border and the Chain Selvedge. We walked through the Sweatshirt Pocket demo. We covered the Bar Increases, uses, how to, setup for, etc. Then we went into stripes – the Knit Stripe, the Purl Stripe, and the Raised Stripe – fun stuff; I’ll bring in more examples next class! For next class, if you have time, please read the section on the Raglan Seamline Decreases pages 42 through 45 (we’ll cover the Raglan Seamline Decreases A-D in this class); and if you are interested in reading ahead, look at the section on Two-Color Knitting, pages 46 to 52. Well, you all are doing great – again, feel free to email or call me if you find you are having a brain freeze – been there.